Are you anxious about graduating? Do you have questions about what lies ahead once you leave Mizzou? Come out to our panel discussion to have a REAL talk about life after you leave Mizzou. Topics regarding joining the workforce, securing internships, pursuing graduate programs, and how to navigate the stresses of adjusting to life in the real world will be discussed. The perfect time to plan for life after graduation is now! 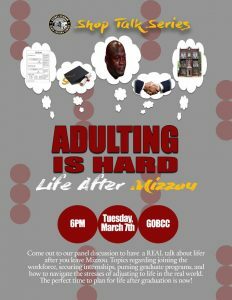 Adulting is Hard: Life After Mizzou will be held on March 7th at 6pm in the Gaines/Oldham Black Culture Center.